Caprese is a very popular Italian dish made with fresh sliced tomato, creamy mozzarella, basil, olive oil, and balsamic vinegar. And it just so happens that caprese is even more delicious when it's grilled between two light and airy pieces of ciabatta bread. Something to remember while you're making this sandwich: this version of this calls for fresh mozzarella because we believe that it tastes better, however, fresh mozzarella isn't that great of a melting cheese. If you'd like this sandwich to have more of a melt factor, then we recommend using a low-moisture shredded mozzarella, aka the stuff you see in the processed cheese section of the grocery store. And although the taste isn't as good as the fresh stuff, processed mozzarella does melt about 100 times better. Begin by building the sandwich. Sprinkle mozzarella and tomato slices with salt. Take one slice of the ciabatta and add the mozzarella cheese then the tomatoes. Next, add a drizzle of the balsamic glaze and the top piece of bread. Close the sandwich and set aside. In a medium-sized frying pan over medium heat, add your hot pepper infused olive oil and place the sandwich in. Swirl the sandwich around so that it can evenly soak up the oil. Grill for a few minutes until it's toasty and golden and then flip and repeat until the bread is perfect toasted and the cheese has begun to soften. 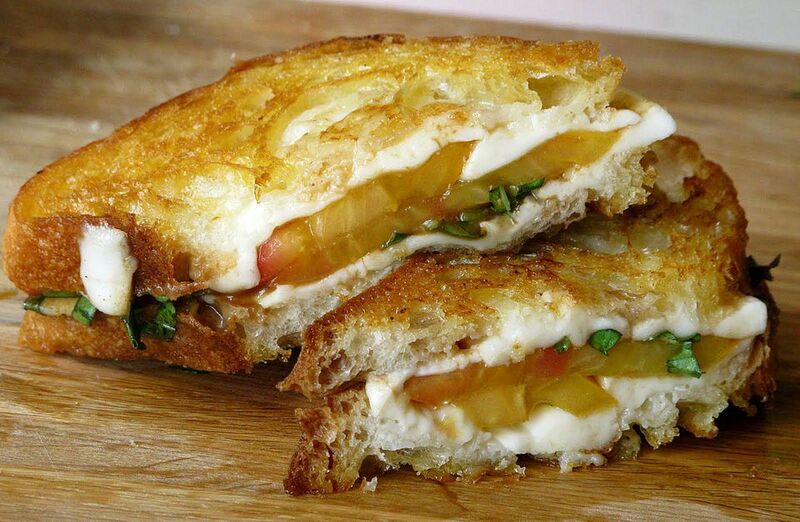 Remove the sandwich from the frying pan and rub the garlic clove over the crust of the sandwich before serving.